Nice pitch. I don’t believe you. One of the arrogant beliefs within ad agencies, including sometimes our own, is the thought that with the right branding, creative and media plan we can influence anyone in our target audience to buy a product. What that belief misses is the power of consumer prejudice. 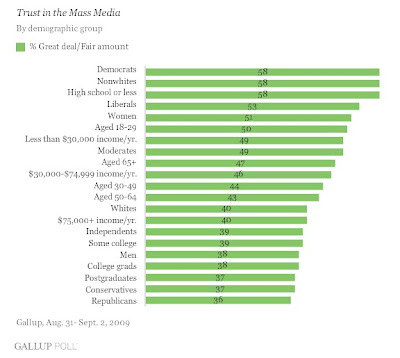 Gallup, for instance, just reported wild doubts among the American population over how credible news media is. This should give marketers pause, because “news journalism” (with the exception of a few cable networks) is supposedly an even-handed, objective presentation of facts to the world. Only 45% of Americans say they have a great deal or fair amount of trust in news media, and the numbers slide further among the well-educated and conservatives (for advertisers, read that as “higher income, desirable customers”). Decades ago Toyota realized it couldn’t possibly overcome its customers’ inherent bias. Toyota was a mid-market brand, and it would never attract luxury car buyers. Rather than fight the perception trap, Toyota created the Lexus … to wild success. And more recently Toyota launched the downmarket Scion brand targeting hip youths who wouldn’t be caught dead in a stale Camry. Prejudice is an ugly word, but everyone has it, because we carry our worldviews around with us and make judgments about actions based on our past experiences. If you were burned by a stove as a child, you didn’t touch it again. When you buy a product and it fits a mold, you put it into that box, and don’t believe it fits somewhere else. Psychologists call this “heuristics,” mental shortcuts humans make to comprehend a world awash in too much information. Your cave-people ancestors didn’t think carefully whether to run when a lion attacked; a flash judgment told them to bolt, saving genes for you. Prejudice and snap logic are the reasons why healthcare reform in the U.S. may fail; health care is enormously complex, people have had bad experiences with paperwork and government bureaucracy in the past, so it is more simple mentally to just shout “NO!” than to try to process a nuanced, and potentially beneficial, reform logic. It’s worth a discussion with your marketing team. How far can you push the brand message to be credible, given your target audience’s preconceptions? And when do you decide you need to become radically new to reach prospects who will never believe your old brand story? A couple of things. Readers don’t trust media because they self select based on pre-determined beliefs, same as your prejudice. Fox viewers distrust the NY Times and vica versa. As for brands, for sure there is some of that. Both the distrust of advertising and also the disbelief that a brand can change from what it is to what it says it is. That was the big issue with GM, even after its cars got better. No doubt the conversation goes on in many places quite often. What costs less, changing what our brand stands for or creating a new one from scratch. Too often brands opt for the former when the latter is really the way to go. I’m not sure that comparing the news media to advertising is apples to apples. The news media are supposed to be neutral so when any bias is perceived coming from the messenger, I think there is a stronger negative reaction from the consumer. Lost faith. For advertising, there has always been a little more give in the relationship. People know they are being pitched and are naturally skeptical in response. That said, the best advertising is honest and seeks to build trust between brand and prospective customer. Sure, it highlights the best parts of a products character, but it tells the truth. The problem I think stems from the fact that lots of marketing people don’t want to face operational problems in there company so they try to use the advertising to make up for real short comings. When advertising diverges so far from reality, it is over. Your caution should be heeded.